Camping in beautiful Australia with only men who love men sounds like a dream come true. Julian Kuiters and Clinton Maxwell made this dream a reality with Camp It. We asked Julian and Clinton to tell us all about Camp It. How would you describe Camp It in one sentence? 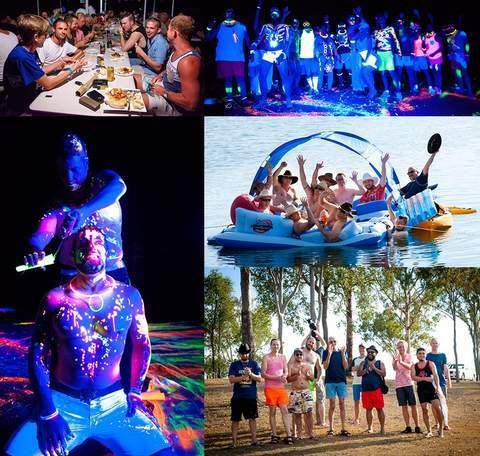 Gay men’s only camping weekend where you can go, relax and just be yourself in a safe place with no judgment: fun parties, games, DJ’s, and shows to enjoy with mates old and new. How did Camp It begin? We are two guys (Julian & Clinton) that are working to bring something different to our community in the way of camping events throughout northern NSW and southern QLD. We created Camp It to be something a little bit different to your usual party. A fun, friendly environment where you can just be yourself with no judgment from anyone. With a mixture of fun group activities, shows, community groups and some of Australia’s best DJ’s playing nightly to keep you dancing under the stars till the sun comes up. We both grew up going camping and it’s always been something we’ve enjoyed. We’ve made a lot of friends over the years through camping so we decided to create awesome gay camping weekends where it doesn’t matter if you’re completely new to camping or bringing along an extravagant camping van you will have a fun weekend and meet some amazing new people. Why are groups like Camp It important? Our aim is always to make Camp It a fun and safe place to go for the weekend camping, unwind, relax along with likeminded guys. It allows you to meet other guys from our community that you would not normally have the chance to meet and make some new mates along the way. We invite community groups along to share important information and raise valuable funds for them. So far we've raised over $4,500 for community groups. We also have fun activities, music and games through the weekend to keep our campers entertained. What special events are scheduled at Camp It? What is included in Camp It tickets?